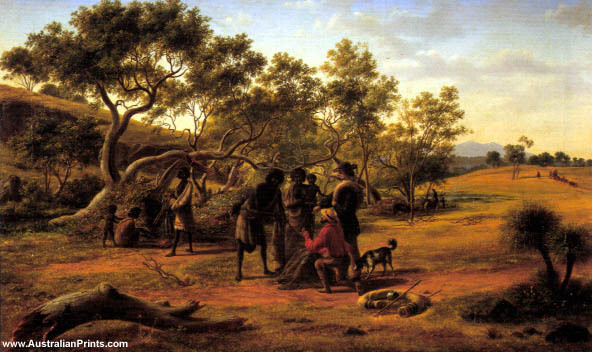 Eugene von Guerard was a landscape artist and is represented in Australia’s major public galleries. Johann Joseph Eugene von Guérard (17 November 1811 – 17 April 1901) was an Austrian-born artist, active in Australia from 1852 until 1882. Known for his finely detailed landscapes in the tradition of the Düsseldorf school of painting, he is represented in Australia’s major public galleries, and is referred to in the country as Eugene von Guerard. Eugene von Guerard was the son of an artist in the employ of Francis I of Austria. He studied in Rome and there became attached to an expatriate group of German artists and writers, the Nazarenes, who were a romantic, religious, revivalist sect. The Nazarenes proposed an art that should be faithful, innocent, sensitive and thoughtful, and that an artist should live a life that is pure and noble. von Guerard’s hard-working and earnest life was well in keeping with the tenets of this reactionary group. Eugene von Guerard began his Australian life in the goldfields but soon realised that his riches were to be found in his own talents and it wasn’t long before he was undertaking lucrative commissions recording the dwellings and properties of rich landowners. He also toured Australia in pursuit of the picturesque. Such was his fame that he was appointed the first head of the National Gallery School of Victoria in 1870 where he was to influence the training of artists for the next 11 years. Artist information page for Eugene von Guerard. This article uses material from the Wikipedia article Eugene von Guerard, which is released under the Creative Commons Attribution-Share-Alike License 3.0.